The Pokes are tied for first early in the Big 12 slate. The winter sports season at Oklahoma State came to an end this weekend, but spring brings out some of the sports Oklahoma State is best at. 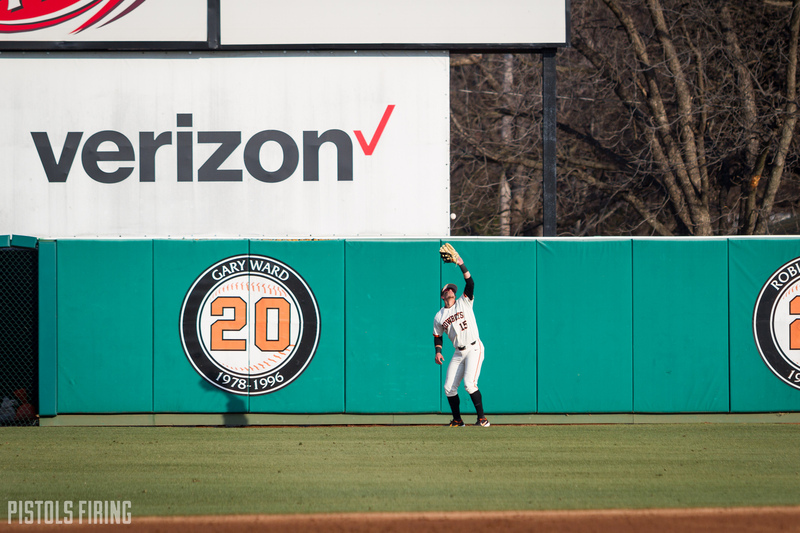 The OSU baseball team opened Big 12 play this past weekend, and (pun intended) baseball season is in full swing. If you haven’t followed the Cowboys’ baseball team quite as closely as you would’ve like to during wrestling and basketball season, here are five things to know about the earlier part of the season. The last opening day has already happened for Allie P. Reynolds Stadium with many more lasts to come in the stadium’s final season. On Tuesday, Allie P. will host its final Bedlam game. The days will soon tick down to Reynolds Stadium’s final regular season game May 18 against Baylor. Unless the Cowboys host a regional, that’ll be the end of an era that started in 1981. There is still history to be made on the field tucked behind Bennett Hall, but time for it is running out. Entering the first of four Beldam games on the regular season schedule, the Cowboys are 15-7. The Cowboys have played five three-game series this season and won four of them, with their only sweep coming this past weekend against Kansas State. OSU’s one series loss came against Iowa at the beginning of March. That series was a bit odd in that the teams played a doubleheader one day and an additional game the next instead of the more conventional three games in three days. Sure, the Cowboys would’ve liked to pick up that extra win against teams such as UT-Rio Grande Valley, Wright State and Southeastern Louisiana, but OSU’s real season (the Big 12) is just getting started, and they’re tied atop the league with OU and Baylor at 3-0. Of the 13 teams the Pokes have played this season, they have a losing record against only Iowa, No. 1 UCLA, and Dallas Baptist. Kansas State is the only Big 12 baseball team below .500 for the season. Four conference teams are the D1Baseball’s Top 25. There is No. 13 Texas, No. 18 Texas Tech, No. 19 TCU and No. 22 Oklahoma. The Cowboys started the season ranked but have dropped to the receiving votes category of many polls. Oklahoma is off to a league-leading 21-4 start, but the Sooners’ strength of schedule has been called into question. The Sooners’ schedule ranks 163rd in the country, according to D1Baseball. Texas Tech entered the season as a national power but has since slipped after uncharacteristic losses, including dropping its first Big 12 series of the year to Texas. Texas might have seemed the favorite after that series, but the Longhorns dropped two of three to TCU this past weekend, setting up a potential rock, paper, scissors game among the three Texas powers. That’s a game the two Oklahoma schools hope to get in on. Carson McCusker leads the Cowboys in batting average (.333), hits (27), doubles (11), triples (three) and slugging percentage (.617). McCusker hit nabbed two of those triples on Saturday, becoming the first OSU player since 2011 to have multiple triples in the same game. In his 12 1/3 innings this season, Ben Leeper has a perfect 0.00 ERA. All of Leeper’s work this season has come in relief. He is usually out there for an inning at a time, securing three saves in his 11 appearances. Leeper, a junior from Southlake, Texas, has allowed seven hits and walked seven batters this season, but he also has 16 strikeouts. As a whole, the Cowboys’ pitching staff ranks near the top of the Big 12 in many categories. OSU is third in combined ERA (.344), third in earned runs allowed (75) and second in hits allowed (165).